2 bombing events in Gaza in 2006, one in Beit Hanoun, one in Jabalia camp, and 2 bombings in 2009, both in Tufah, the Gaza suburb. We have also analyzed the powder remaining inside a shell of an exploded White Phosphorus bomb THS89D112-003 155MM M825E1 collected at Al Wafa in January 2009. All craters were big and the sampling was conducted along one of the sides of the slope of the crater. The locations of the craters are grossly indicated in the map below. In 2006, the samples were collected two weeks after the end of the attacks. In 2009 samples from Crater 1 and 2 in Tufah were from bombings occurred on January 14, and the samples were collected on January 28. 1-The data show that significant amounts of Tungsten (170-350 ppm and 20- 42 folds the average level (8,5 ppm) expected in the soil) and higher than normal level of Mercury (0,082-1,634 ppm and 8-16 folds of the maximum level found in a survey in 2003 of 170 location of the soil of Gaza, (0,01 ppm) ) were found in a large crater produced by a bomb exploded in Beit Hanoun in 2006. The other 3 craters examined had expected level of normal soil for these metals. Both Tungsten and Mercury are metals which have serious toxic and carcinogenic effects on humans at medium-high concentrations. Mercury is a classified carcinogenic agent which transfers from the skin to the foetus and cause fetotoxicity in animals. Tungsten and tungsten alloys are genotoxic and suspected fetotoxic, and at lower concentrations tungsten causes respiratory and neurobehavioral pathologies. Both elements are rare in nature and their finding in one of the craters induces to assume that were brought by the deflagration of the bomb, that has spread the metals in a radium of unknown dimension and might have produced contamination of water, soil and crops around and eventually humans. 2- Molybdenum, a rare element in the soil, is found at high concentrations in all the craters examined. The amounts found are 0,1 to 12 ppm and between 25 and 3000 folds than average levels (0,004 ppm) in the soil. Molybdenum is a known component of alloys with various metals (single and multiple metals) some of which are used as components of weapons. Molybdenum is toxic for sperms and in high levels produces effects on reproduction and foetus. 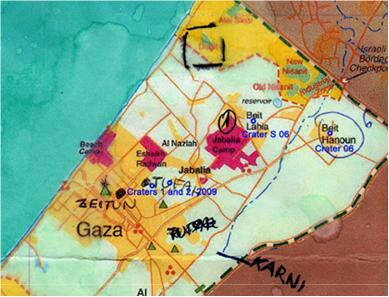 3-Cadmium is an element present in low concentrations the soil of Gaza (0,093 ppm) , and it is known carcinogen. We found a high amount of Cadmium (up to 7,3 folds) in one of the craters from 2009 bomb in Tufah. 4- Cobalt was found in amounts up to 26,2 ppm (compared to 5,1 ppm average in the normal soil) and it was from 5.1 to 2 folds in the craters from both bombs exploded in Tufah in 2009. Cobalt can inhibit DNA repair and cause DNA breakage (mutagenic). 5-Nickel, Manganese, Copper and Zinc were found in one of the craters from bombing in 2009 at a 2 fold level than in soil. Some of the Nickel and Manganese compounds are carcinogenic. 6- Strontium is also found in amounts higher than average in earth crust in all craters, but its concentration varies in different locations and there are no data available for the soil in Gaza. The powder was scraped with a plastic spoon and a piece of glass, from the sides and bottom of the shell. According to Barbara Rome at “Defense News” magazine approximately 3500 phosphorus shells were fired over Gaza during the 2009 attacks. Aluminium was also found in high amounts (218000-524000 ppb). Al excess is involved in degenerative diseases of the nervous system. Aluminium trespass placenta, if contamination occurs by skin exposure of the pregnant mother, and produces fetotoxicity. The powder contained also relevant amounts of Molybdenum (125-200 folds of the content in soil), Tungsten (up to 41 folds of soil content) and of Mercury (up to 160 folds), showing that also these shells have an environmental load due to the fact they carry toxic metals and suggesting that their widespread use in explosions in open air must have sprayed the whole territory with these metals in addition to the WP. The use of devices that carry and spread to unknown distances high amounts of toxic metals poses the question of the present contamination in the territory of the strip of Gaza. One report on the presence of metals in the soil of Gaza, with samples in 170 locations, published in 2005, could be a reference for comparison, if a more systematic collection of samples is undertaken, as it should. The potentially widespread contamination of the soil, concurrent with the conditions of the displaced population that lives in this environment close to the ground and exposed to the possible contaminants, with the possibility of skin, respiratory and alimentary chronic assumption, urges to undertake further studies. At a distance of years these should be directed to test of contamination of humans, crops and food animals. In addition, there are some potential remediation strategies that could be applied to the population, which might reduce the damage from metal contamination. Studies for implementation of good practices should be undertaken as soon as confirm arrives of the assumption by individuals. This is especially important for young people in reproductive age and for children, due to the fact that chronic effects of metal contamination can affect reproductive performance (fertility and malformation are potential effects) and children neurological development. Rapidly, a collection of data needs to be done to establish the contamination by metals of the population of Gaza. This is by all means the first issue, but not the only one that need to be addressed by the scientific community and that should be of serious concern for the international organizations with the institutional task to promote and preserve world health. These should take a promoting role and should activate support for the needed research and for the medical professionals and scientists. Other points that need further studies to understand the relevance of the contamination are the isotopic analysis of some of the compounds (Strontium), studies to define if these elements are in elemental, or aggregated forms (by size and by chemical composition), if the assumption of multiple metals at high concentrations has complementary pathogenic/genotoxic effects, a possibility suggested by experimental studies in animals. 2- B.H. Shomar_, G. Mu¨ ller, A. Yahya Geochemical features of topsoils in the Gaza Strip: Natural occurrence and anthropogenic inputs. Environmental Research 98 (2005) 372–382.